Here’s Katy Perry’s hairstyles over the years. Katy Perry looked majorly glam in a slinky metallic, sequined gown and her hair in a tousled blonde bob, all for the 59th GRAMMY Awards. Katy Perry cosies up in a bronze beaded gown and she sported a sleek blonde bob hairstyle to contrast her outfit for this 2017 Vanity Fair Oscar Party at the Wallis Annenberg Center. 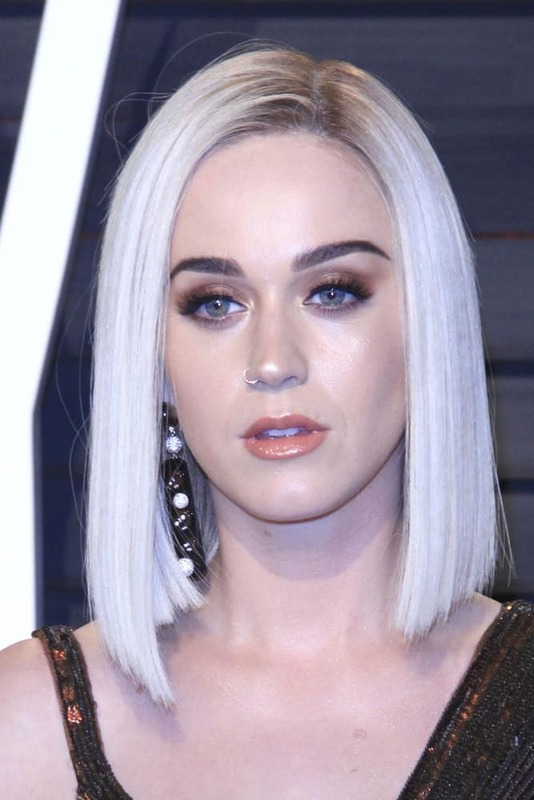 Katy Perry experiments with her blonde locks and styled it with a daring faux-hawk. She oozed glamour in this embellished mini dress with a matching blazer that's certainly made an impression during the 2017 BRIT Awards. Katy Perry sure made a statement in a red off-the-shoulder petal-embellished gown and she's so sleek and tidy in this low center part bun hairstyle as she attends the amfAR Cinema Against AIDS Gala 2016. For more celebrity hairstyles like Katy, click here! Katy Perry is a golden Goddess in a glittering Champagne off-the-shoulder floral beaded gown and her brunette hair was gathered into an elaborate updo with extravagant earrings to satisfy the audiences at the CHLA Once Upon A Time Gala. Katy Perry went dramatic wearing her gold embellished black gown and her dark hair was swept into a towering present day beehive with short bangs while wearing a bold make-up + eyebrow-free to complete the look at the 2016 MET Gala. Katy Perry rocks in black with her elegant black sleeveless gown and her medium-length raven hair was sleekly styled into loose big curls with center part during the "Office Christmas Party" Premiere at the Village Theater. Katy Perry blooms in a rose-pink satin column gown and this vintage Brigitte Bardot inspired updo hairstyle really amped up her gorgeous frame as she attends the Weinstein Company & Netflix 2016 Golden Globe After Party. Katy Perry is having fun wearing her metallic blue jacket paired with a high-waisted skirt and pink halter that goes well with her retro-inspired half up half down wavy hairstyle as she attends the 51st Academy of Country Music Awards. Katy Perry looks sleek in a form-fitting black dress and paired her bold look with a messy upstyle as she attends the Katy Perry: The Prismatic World Tour Premiere. Katy Perry rocks a purple tousled hairstyle to complement her crystal-embellished sheer dress at the Grammy Awards 2015. A really unique short hairstyle for a playful artist like her! Katy Perry in an eccentric and eye-catching black dress with a high slit and bow detail. At the top, framing her beautiful face is a slicked back textured hair, a dramatic hairstyle she wears at the "Jeremy Scott: The People's Designer" World Premiere.